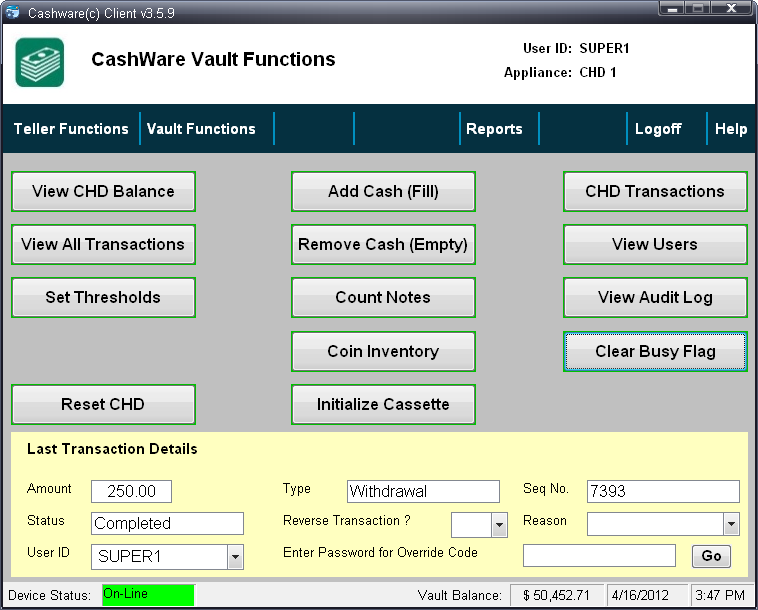 Our CashWare product line originated with the popular middleware product, but it has grown to an expansive product line. Each new product was developed in response to a customer request, and the product line will continue to grow as driven by the market. We also offer customized Cash Recycler Workshops for you to come to our facility to learn more about all the latest models of recyclers under one roof. To learn more about our commitment to cash automation, please visit btg-cashware.com. CashWare is our flagship product used to support cash recyclers and cash dispensers. CashWare is middleware software that links the recycler or dispenser with your core provider teller application. Over the years, CashWare has gained popularity and become a favorite among tellers. Many of our sales are to replace other software products to extend the functionality of the hardware and teller application. Today, CashWare is endorsed by manufacturers and core providers to provide customers with a higher level of functionality, reliability and ease of use and recommended with new installations. 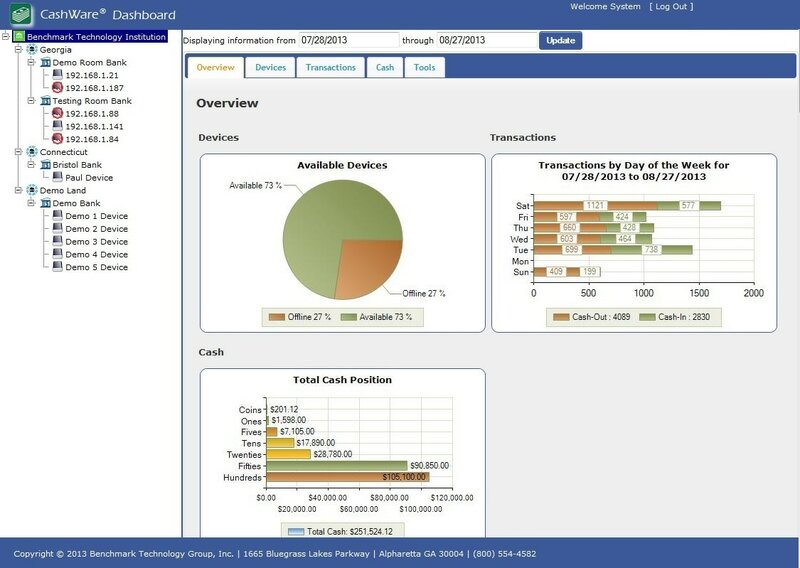 CashWare Advisor provides an enterprise dashboard to monitor and manage a customer cash handling network. It is a browser-based application hosted on a customer server and provides any authorized users to have access to the monitoring console. Advisor has lenses that provide a view to device cash position, transaction activity and device health. These metrics can be viewed summarized or by region, branch or individual cash recyclers or cash dispensers. The device health features provides a visual status of all the included devices to identify any devices not in use due to hardware problems or other reasons. The cash analytics can be exported for further processing by your cash management system. CashWare Connect is a developer application program interface (API) that offers immediate support for all CashWare certified recyclers and dispensers. It allows developers to focus on the business logic of their teller application and via the same commands with the device management layer handled by CashWare Connect. This API significantly reduces development time and the skill-set required to support each hardware device. CashWare Connect supports a number of application architectures. CashWare SST is Benchmark's answer to the digitally enabled customer. With CashWare SST, banking transactions have been extended to a kiosk hardware platform and optimized to complete the most common teller transactions. This software allows customers to easily perform transactions in the comfort of the branch with bankers readily available to assist at any time to discuss any other banking needs. CashWare SST also offers a companion tablet application to extend teller capabilities and increase customer interaction. CashLink was developed to extend the functionality of currency counters by interacting with the teller application and automatically exporting deposit/withdrawal amounts into teller system transaction “cash calculators” or “total cash fields.” CashLink eliminates bill count and amount keying errors and saves time through software integration and tracks the cash received or dispensed in any teller transaction.